Throughout the year, the Mendocino Coast Botanical Gardens in Fort Bragg is a place to take in beautiful blossoms that thrive in the ocean air. But during the holidays, the gardens' earthy delights give themselves to flights of fancy, transforming into neon-pink ostriches, a flamboyant serpent, and a boat bedecked with such brilliant white "sails" as to make a lighthouse redundant. 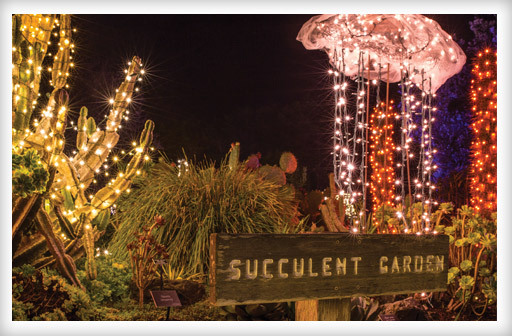 Such are scenes from the Gardens' Festival of Lights, during which the grounds are turned into a vibrant display of color and whimsy. The festival runs Fridays-Sundays, through December 16, 5-7:30 p.m. (last entry at 7 p.m.) Tickets are $10 for adults and free for kids age 16 and under. For those who don't want to park on the premises, a parking shuttle will pick up passengers at the Mendocino Community College in Fort Bragg. See gardenbythesea.org for further details.